$50.00 In stock. Order in the next 2 hours, 45 minutes and it will go out today! For years, many magicians asked Bruce to create a Growing and Shrinking Head Spiral to fit into suitcases, briefcases and backpacks. He's done it! This new spiral folds in half because of a cloth hinge that has been fused with a special glue to the back of the spiral. That makes it half the size. The hardware that is included keeps the spiral rigid when it spins. It's the perfect solution to performers who travel a lot on planes or have minimal room in their show cases. 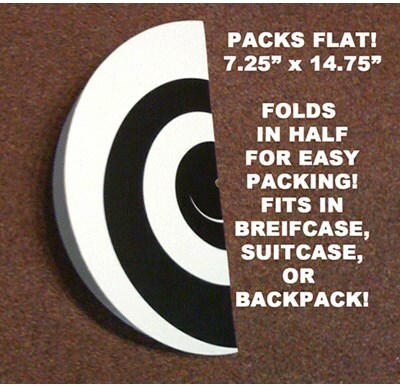 At a recent convention, Bruce walked around with the folding spiral and magicians were crazy excited about it. Without doing a thing, you perform the most talked about illusion in your act! DO NOT CONFUSE THIS WITH ANY OTHER SPIRAL ILLUSION YOUR HEAD ACTUALLY LOOKS LIKE IT IS INFLATING LIKE A BALLOON! Bruce Kalver performs at many schools doing his EYE DON'T BELIEVE IT Science magic show. Out of all the tricks he performs in this educational based assembly show, THE INCREDIBLE SHRINKING AND GROWING HEAD gets the most response. Magician displays a 15 inch specially made spiral disk. Kinda like you'd imagine a hypnotist using. The spiral is spun and you instruct the audience to stare at the spiral and don't look away. You start to count backwards from 10 to 1 and when you reach one, tell the audience to look at your nose. TO THEIR AMAZEMENT, YOUR HEAD BEGINS TO GROW LIKE A BALLOON BEING INFLATED! All the spirals are specially drawn and printed for us. The spiral can be seen in large auditoriums or use it at a birthday party. People are amazed and always yell "do it again!" The hardest part of this illusion is trying to keep a straight face as your entire audience stares at you in disbelief with their mouths wide open. You are going to love this! PLEASE NOTE: Motor not included. If you don' have a motor, All spirals come with an adapter to attach to a Black and Decker cordless screwdriver. I haven't tried it out yet. Why? because it comes without a handle. "Just a trip to the hardware store will solve it". Well yes. It would. I'm a fan of vanishing and amazekids because the products are for working pros. Well this product is incomplete. I have yet to tweak it for professional use. Perhaps you could at least give us a hint on which type of handle would suit better or something. Or perhaps something we can use for the spiral to turn around by itself like in the demo. Because I think it adds to the illusion if the magician is away from the prop.